While traveling through Saskatchewan, Canada in the summer, the Qu'Appelle Valley is one of the brightest places to be as many of the canola fields are adorned in yellow flowers. Each field spans for miles across the Qu'Appelle Valley and on this particular day, small white clouds float aimlessly by while the fields explode in color. Canola has been grown for many years when it was used for making edible oil for animal food, biodiesel as well as uses in the everyday lives of people when cooking. Every year, there is about 3 to 4 million tonnes of canola seed which is shipped from Canada, along with shipments of approximately 700,000 tonnes of canola oil. 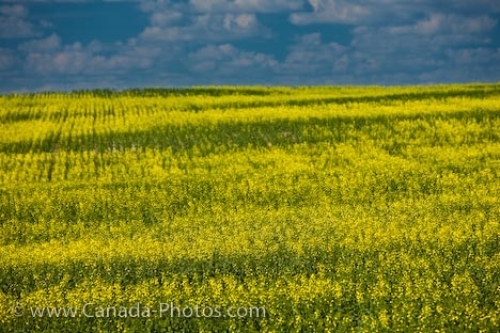 Canola fields can be tedious to care for, but the farmers in the Qu'Appelle Valley in Saskatchewan never seem to give up as it is a big part of the agricultural world in this area. Picture of a canola field adorned in yellow hues during the summer in the Qu'Appelle Valley in Saskatchewan, Canada.